The excerpt below tells the tale of a futuristic unmarried woman who keeps a robot under her bed. 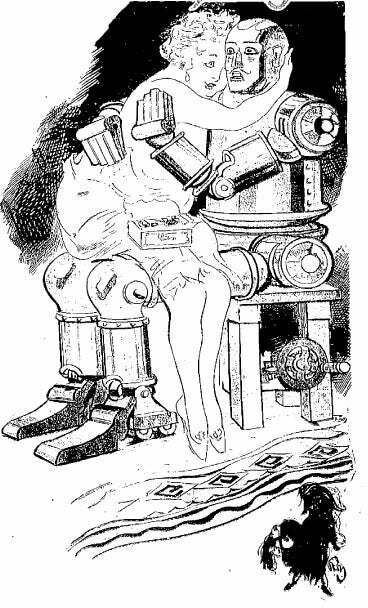 This automated man, which was naturally all the rage in 1929, gives her all the love and attention no “mortal man” will give her. The woman, even in such a contrived environment, must feign astonishment that a “man” would be in her bedroom. At the same rate of progress it should not require more than a decade or so before a person can go to a store and pick out from the show case most any kind of automatic man or woman he or she might fancy — an ideal servant or workman who would ask no food or wages but a little current and an occasional drop of oil; or even a flattering admirer could be purchased who would whisper in a neglected wife’s ear, all the nice things that a busy husband forgets to say. In this happy future, no old maid need look under the bed for a man, in vain. He would always be there and such a nice man, a perfect imitation of her favorite matinee idol or film star, with blond or dark hair, moustache or clean shaven, anything her heart desired. These would be stock models, turned out in quantity production and quite reasonable in price. This year probably a “Lindy” model would have been a big seller. Or, if the customer is willing to pay a little more and have one made to order, the manufacturer might send artists and photographers to some notorious lounge-lizard and deliver a perfect counterfeit of him. She could order the late Rudolf Valentine’s face and John Barrymore’s voice or most any other combination. At that cue he would crawl out and on bended knees, pour out words from 1,000 feet of phonofilm, revealing his hopeless passion for the love-starved old maid, telling her how beautiful she is and all the other sweet things that somebody out to have said but no mortal had bothered to. When she tired of hearing this over and over, a word of encouragement would be the end to slide into place in his manly chest, another reel and at the same time he could sit beside her on the couch or take her on his substantial knees, embracing her with a tireless mechanical arm. The introduction of this kind of automation would throw out of work a small army of “gigolos,” young men who in Europe, pay attention to old and unattractive ladies of wealth, for a consideration.